Edmund Ian Grant, The Messenger, 2014, Acrylic on canvas, 60" x 41"
Currently, the Walter Wickiser Gallery features three one-person exhibitions that propose very different and deliberate takes on the human psyche. 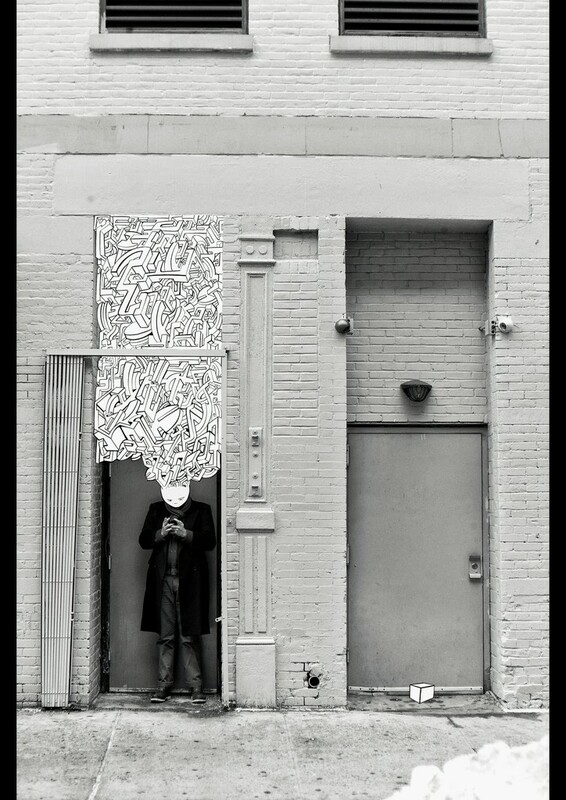 Each artist elaborates on the essence of being, one's state of mind, conscious or unconscious - it all counts. A second unifying thread in all the art here is the fact that the computer and its many graphic functions plays a significant role in their process of creating art. Edmund Ian Grant, who is the only one of the three that currently employs color to express his observations, begins his creative process with a series of studies that employ any and all media to construct preliminary compositions. From there, the most inspiring study of the lot is digitally photographed then printed on canvas in non-descript, darks and lights. This leaves the artist any number of opportunities or avenues to either change or enhance the surface with multiple layers of color. The result is quite mysterious and potent as each portrait or scene teeters on the edge of change where a soul might be arriving at a pivotal crossroads or defining moment in their tortured life, to a quiet moment of repose following a never ending daily grind. Being a jazz musician in addition to a visual artist, we see an improvisational mindset in Grant's style that puts forth a multitude of visual prose and passages that manifests itself most often in nighttime vignettes. Given that darkened mood or atmosphere, Grant sometimes includes a brightly colored end of a lit cigarette and red-eyed pupils of his subject to pierce the shadows, as with Palookaville (2014), The Messenger (2014) and Here's That Rainy Day (2016). 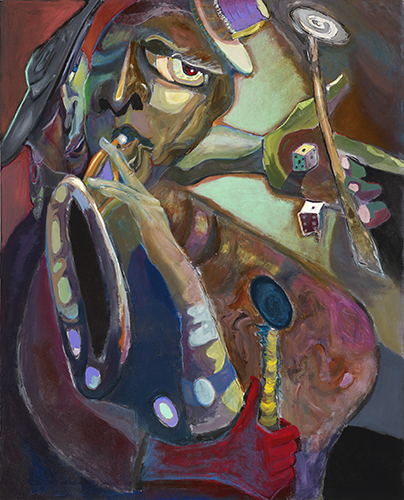 Edmund Ian Grant, Tossin' Dem Bones, 2013, Acrylic on canvas, 60" x 48"
There are a number of Grant's works that include musicians, including Tossin' Dem Bones (2013), where dice (bones) is being thrown behind a soulful trumpeter. What is most interesting about this particular narrative is the artist's use of visual space, the distortion of the forms and the dynamics of the composition that make the whole thing 'off' in a very cool and compelling way. It reminds me quite a bit of what was coming out of West Germany in the 1980's when artists like the Neo-Expressionists Jörg Immendorff and Helmut Middendorf where making themselves known here in the U.S. as the next wave of bold, figurative, narrative painters. 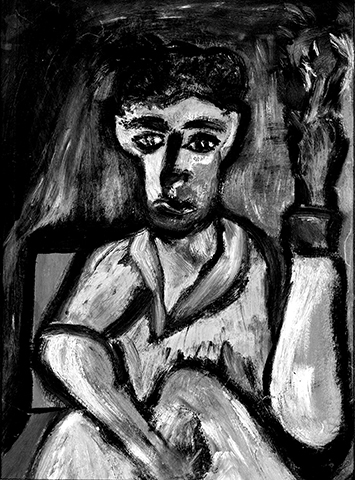 Aside from the modified Cubist style that Grant features, it is impossible to look at his art without thinking of Picasso, especially with the mixed media painting titled The Stain of Humanity (2016), when one notes the brightly shining lamp or candle that is featured as a primary element within the composition, and the shadow of a bull in the rather quiet background. Robert Firestone, Schizophrenia, 2016, Lightjet print facemount acrylic, polished edge, acrylic back, 30" x 40"
Robert Firestone, the clinical psychologist, author, and artist offers a series of works that focus on the more fragile aspects of the human condition. Schizophrenia (2016) has a definite intensity, ala Georges Rouault, while works like Confrontation (2016) and Girlfriends (2014) have a sort of 1960's psychedelic feel that is quite stimulating to the eye and mind. Sangjun Chon, Jeux Des Image 4, 2015, Pigment prints, 26" x 36"
Sangjun Chon offers a bit of comic relief, albeit dark, with his wonderfully altered photographs. By combining photography that can be looked at as benign, incidental, even peripheral with 'drawings' that expand the narrative geometrically, Chon brings us to a place where Surrealism, the Graphic Novel and the subconscious mind can meet and make magic amounting to very exciting work that is well worth watching.